Sometimes simple ideas are best, and never more so than in this inexpensive decorating idea to update the look of your curtains. This easy paper napkin curtain valance is also a great way to decorate for a theme party, birthday party, wedding reception, baby shower or anniversary celebration. 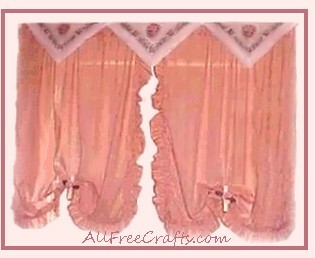 I was tired of those same old curtains so I decided to try this great curtain decorating idea shared by a friend. I’m in love! Thanks, Cynthia! The prettiest paper napkins you can find – dollar stores sometimes have surprising bargains! These are the shortest instructions ever, but don’t be fooled by the simplicity of this project; after you try it once, you’ll be wanting to update the curtains in other rooms as well. Start by opening one of the napkins, cover it with a cloth, and iron to remove the fold lines. Repeat with each napkin that you will use. The number will vary depending on the width of your curtains. Drape the napkins diagonally over the curtain rod, as shown in the photo. Begin draping with the napkin in the middle then moving outwards to the left and to the right. Pick a color from the napkins that you wish to emphasis, and paint your clothes pin in that color. Let the clothes pin dry, then glue on some coordinating silk flowers and leaves. Use the clothes pin to draw up scallops on the bottom of your curtains – est Voila! When you get tired of this look, just toss the napkins away, and go for a stripe or entirely different pattern, and start again. I love it. I’m so glad that my friend Cynthia shared this window treatment with me – the final cost was $2 for four windows!